How did the Victorian well-to-do choose to live if they found Newport's Bellevue Avenue to be just too, too much? The Green Animals small country estate just up the road -- approximately 8 miles from Newport and 0.7 miles west off of SR 114 on Cory's Lane -- in Portsmouth, R.I., gave us one answer. With the namesake topiaries just around back, it would have been easy for us to pass over Thomas Brayton's summer residence, but we really did spend a half-hour inside. Almost every one of the ten rooms in the clapboard house expressed the Brayton family's affection for children, with period furnishings ranging from serviceable cribs and baby buggies to tyke-sized tea sets, tin-soldier dioramas, Brayton memorabilia, and other Victorian toy collections. Yes, the green animals themselves are surely one of the seven wonders of Rhode Island. Elephant, ostrich, camel, giraffe, lion, dinosaur, and dozens of other creatures -- all lend a friendly flavor to the estate's formal gardens. But the outdoor glories go beyond these miracles of boxwood and privet. The Brayton estate, originally designed to be self-sustaining, includes formal, rose, herb, fruit, and vegetable gardens, espaliered fruit trees, a fish pond, a pet cemetery and a children's garden. When all's seen and done, we took a stroll on the great lawn, which stretches nearly to the edge of Narragansett Bay. And picnicking is permitted! Directions: Look for Green Animals signs on Route 114. The estate is less than a mile west on Cory's Lane. But don't strangle these creatures, or they'll become "gangrene" animals !! Thomas E. Brayton, Treasurer of the Union Cotton Manufacturing Company in Fall River, Massachusetts, purchased the estate in 1872. 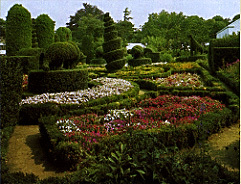 Joseph Carreiro, Mr Brayton's superintendent from 1905-45, began to develop the remarkable topiary garden (some writings say it was started as early as 1880). In 1940, Mr. Brayton's daughter, Alice, made the estate her permanent residence and work continued on the topiary by Mr. Carreiro's son-in-law, George Mendonca, until his retirement in 1985. 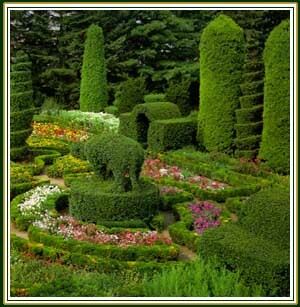 There are 80 pieces of topiary surrounded by boxwood-lined ornamental gardens, including 21 animals sculpted in privet and yew, as well as boxwood and privet geometric forms and ornamental designs. Here you have completed a tour of ALL the mansions we have visited within Rhode Island in the order that we have seen them -- however, you may start the tour all over again, go to an overview of all those RI mansions, go back to our Rhode Island page, or return to the beginning of S&L's Adventures Emporium.